Happy New Year I hope you will have a happy, healthy and peaceful 2015 and be able to enjoy some regular inspiration time to create and make beautiful art. 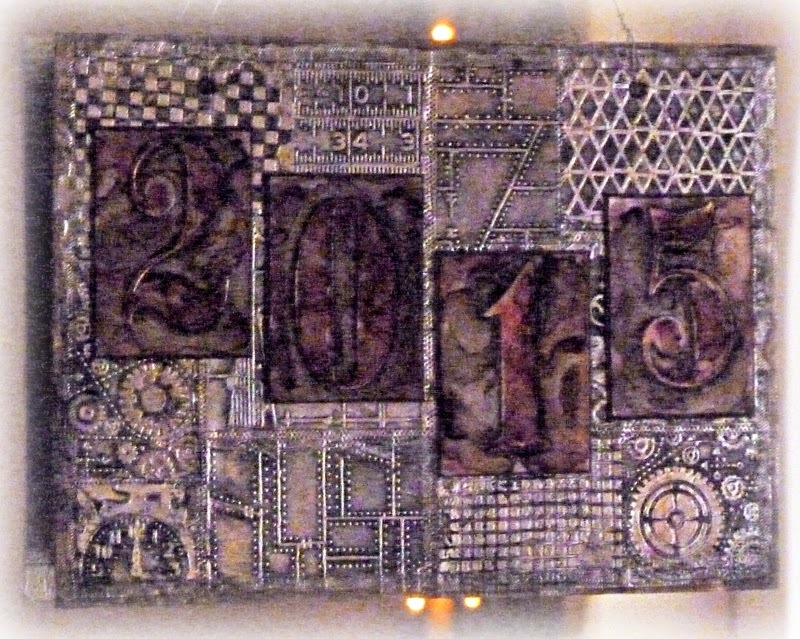 I am starting the year with something special I made to hang in the dining room for our new years eve party - a plaque to hang over the mirror with the year on it..
Cut 4 ATC size pieces of card (2 ½ x 3 ½ ins) covered with foil tape and run each one through the texture trades numbers set for 2015. I've used a mixture of Ranger foil and DIY foil. 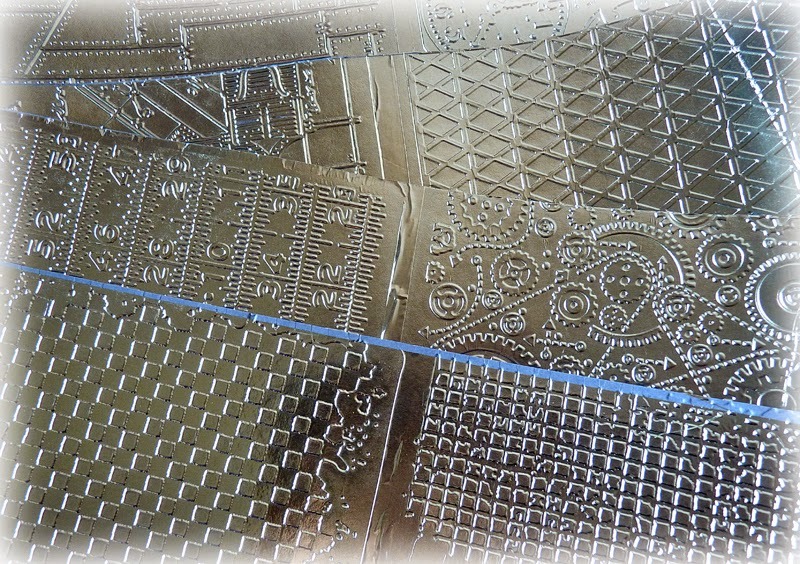 Cut more pieces of card covered in the foil tape and run through a selection of embossing folders. 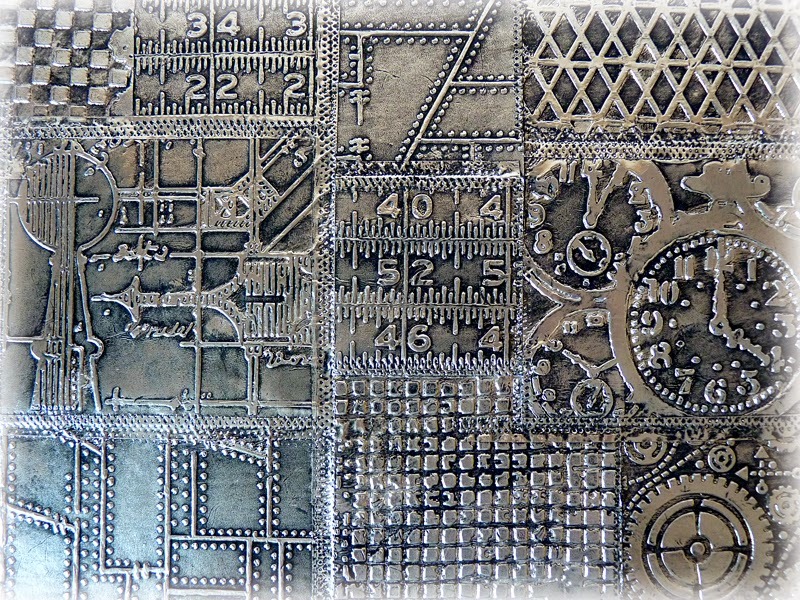 And adhere the patterned pieces of foiled card patchwork style to an A4+ sized piece of greyboard. 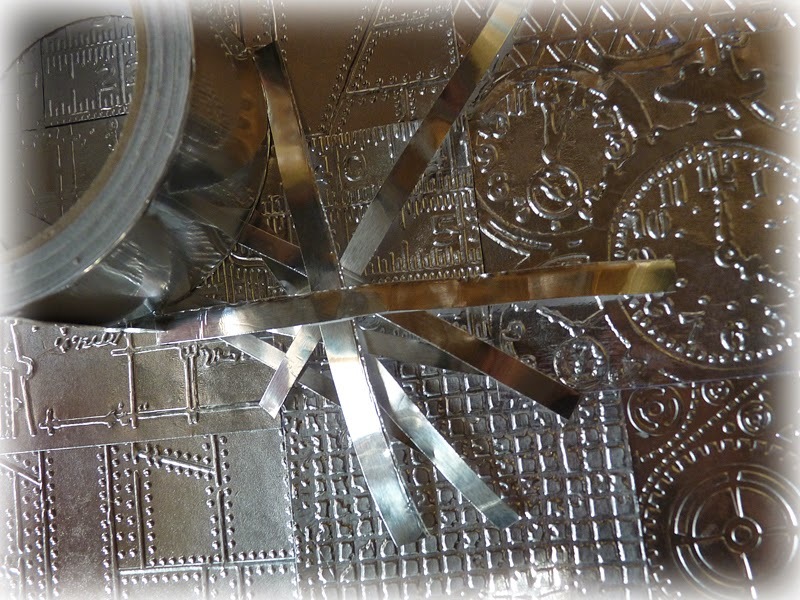 Add strips of the foil tape to join some of the edges and to seal the edges. Paint over the whole piece with black soot distress paint and before it’s dry wipe over with kitchen towel to take most of it off leaving black paint in the crevices. Next take the numbers and again paint and wipe away the excess, let them dry. Blend alcohol inks over, then drip some blending solution over then recessed areas and wipe off. I was aiming to get reddy numbers and a brown background. Drip the browns in the recessed areas and again drip a couple of drops of blending solution on. Pick them up and move them around so that the colours move across the foil. When dry I got a very small paint brush, the black soot DP, the brown alcohol inks and blending solution. I painted some black around the numbers to help them stand out more and then just played with the other supplies until I was happy with the blending and colourisation. 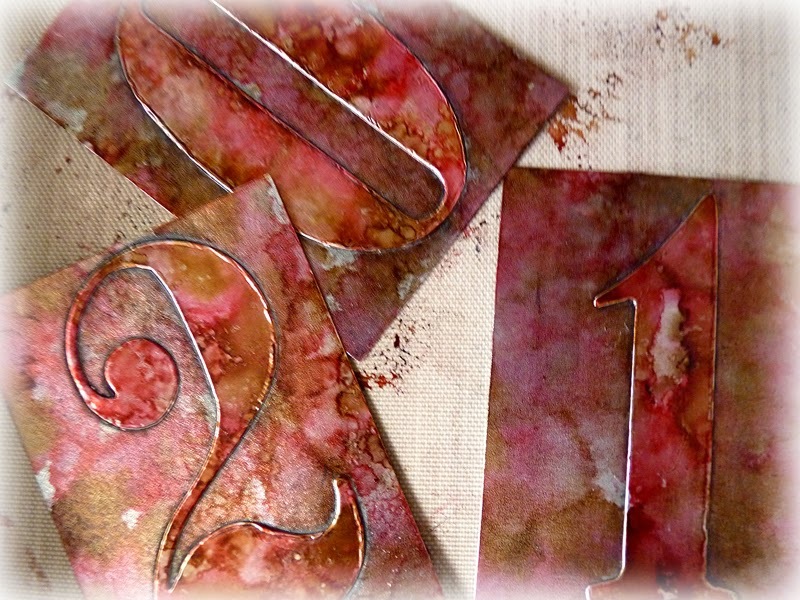 The numbers were mounted onto brown card and adhered to the board and a spread a little teak wood alcohol ink around the edges to frame it (just like I would with vintage photo or walnut stain distress ink on my papercraft projects). Add some snaps with the Cropodile and some wire to hang it by. It was dark by the time I got to take this photo so it looks completely different to the one above it, but here it is hanging on the mirror, you can just see the reflection of some Christmas lights. Thank you for all your support and wonderful comments last year, I so appreciate them particularly when my teaching schedule got so busy and I couldn't get round to see you all as well. But new year and fresh start, I am definitely going to try and do better. 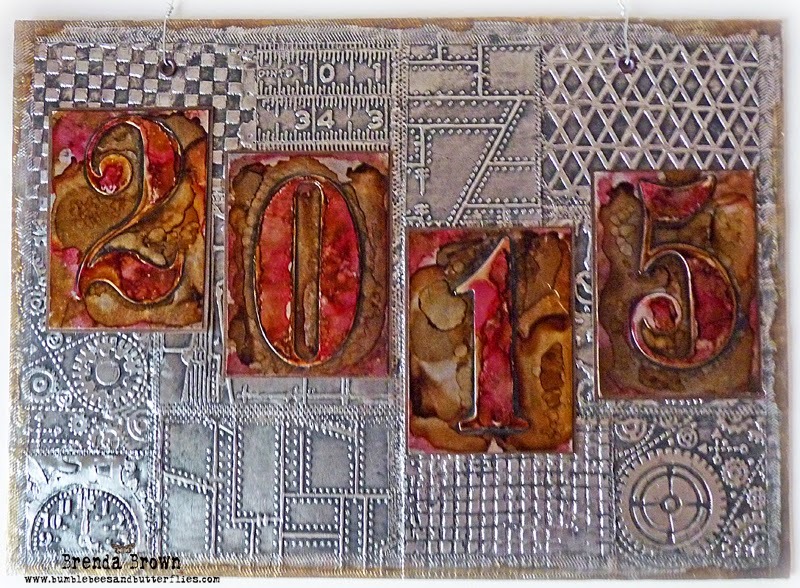 Happy, healthy and creative 2015 Brenda! Your plaque is wonderful...love the foil technique (have used it myself some time ago). Your plaque is beautiful Brenda! Looks like a lot of fun was had here Brenda - hope the party went well & the head is not too sore! Lovely project, Brenda, and so much attention to detail. Love the colours on the numbers. Hope you had a wonderful evening, and wishing you all the best in the New Year. Thanks too, for your lovely card! Fantastic wall hanging, Brenda. 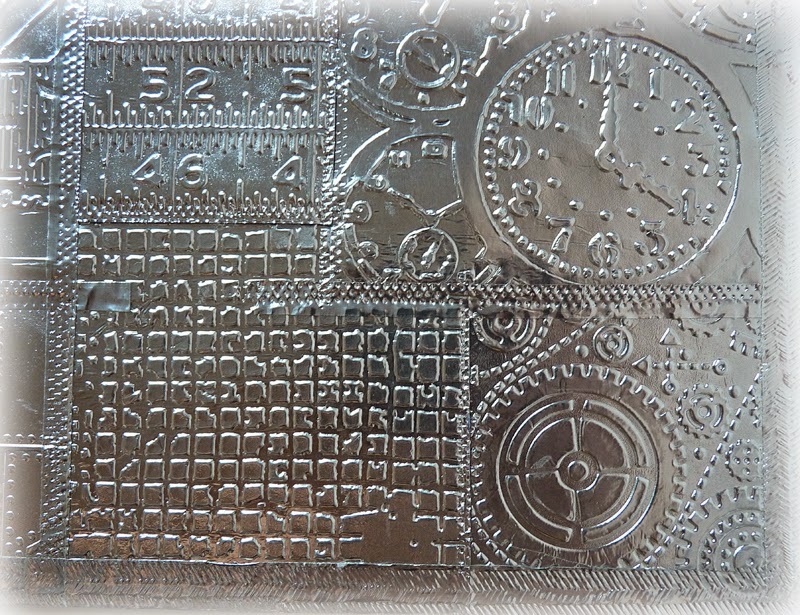 Love the embossed metallic look and the way you have distressed it. Thanks so much for sharing your process! Wishing you and your family the very best in 2015. 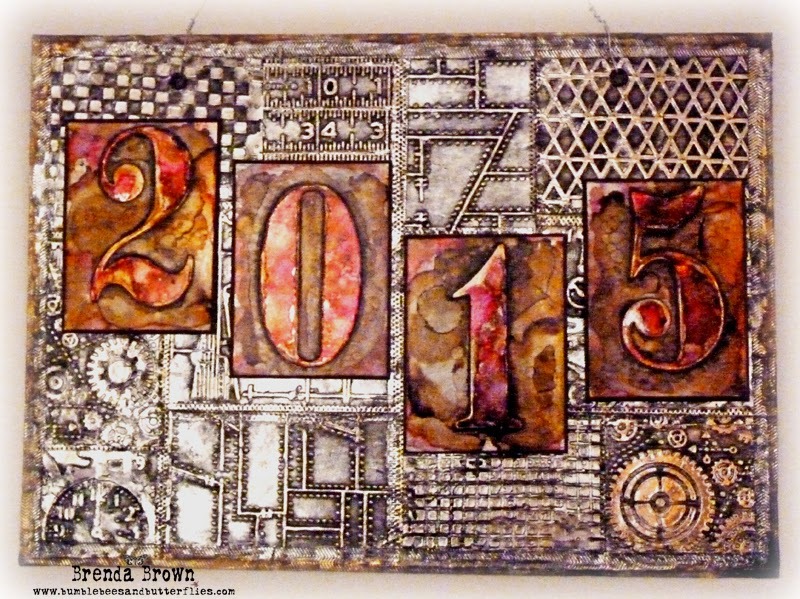 So cool, Brenda - fabulous metallics and the glow of the inking is wonderful. Hope the party went with a swing! Happy 2015! Gorgeous! Love the sheen and the texture. Wishing you a wonderful New Year, Brenda! !